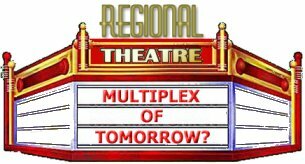 Eperformer.com: Regional Theatres - Multiplexes of Tomorrow? The movie industry has implemented some pretty sophisticated sales techniques in the last couple of decades. They've targeted their marketing efforts so that everyone in the country knows all about a new release before the movie even opens. And with multi-screen cinemas having all but replaced the old fashioned movie palaces of yore, the studios can ensure that everyone has a chance to see a new film during the first few days of its release, taking full advantage of that all-out marketing push. Everything is geared around that critical first weekend. Want to learn more about America's Regional Theatres? Visit our page of links to various regional theatres around the country. But can that approach be applied to America's regional theatres? And, more importantly, should it be? Whether we like it or not, that's what's been happening, on one level or another. Regional theatres have traditionally been the conduit for high-quality live theatre for urban areas outside of New York City. They've presented new productions of classics and, perhaps more important to the overall health of American theatre in general, they've given playwrights an opportunity to see new works staged in high quality productions. In the last several years, however, there's been a third category added: productions of recent off-Broadway hits. Taking a cue from multiplex marketing, regional theatres often choose to capitalize on the buzz generated from successful plays in New York. Is this to say that these plays don't merit regional productions? Not at all. More often than not, the reason these plays get produced is that they have been proven to be good plays. But there is a troubling aspect of this trend. As the spectrum of what gets produced gets narrower, fewer new plays get produced at regional theatres and, consequently, fewer new plays get considered for off-Broadway and Broadway productions. It used to be that Broadway shows had out-of-town tryouts. They'd play New Haven or Philadelphia or Boston (or maybe all of those cities) to get a feel for working in front of real audiences and to identify weaknesses in the shows themselves. In musicals, songs were added or removed, choreography reworked, books expanded or reordered. In straight plays, scenes were cut or added, plots were solidified, and, sometimes, complete roles were removed, added, or recast. By the time a show made it to New York, many of the kinks had had a chance to be worked out. Gradually, New York producers started looking to regional theatres to have this first phase of production completed. A local success, given renewed attention and often times a larger budget, might be parlayed by an industrious producer into a full-scale Broadway hit. This is not to say that the only purpose for productions of new plays in regional theatres is to provide literary fodder for commercial producers. Many plays of considerable literary and artistic merit are simply not commercially viable but are still worthy of productions in regional theatres. The recent trend, however, turns the tables. Regional theatres are now looking toward off-Broadway and Broadway for sure-fire hits. The cold financial reality of keeping a regional theatre afloat may require leaning toward productions that are expected to be commercially successful. This new way of doing things creates a missing link. Broadway and even off-Broadway productions of original works are almost entirely cost-prohibitive. And if regional theatres are looking to off-Broadway and Broadway for their standard fare, where are new works to come from? Where does this leave the emerging playwright who is hoping to have his or her new work produced? Where does that leave established playwrights who want to mount less commercially viable works? If the trend towards safety and guaranteed income continues, where will the new plays come from? Perhaps more importantly, where does that leave regional theatre audiences? Over time, with theatres all over the nation producing only a narrow spectrum of commercially successful plays, will audiences become homogenized? Will audiences inadvertently be dumbed down by exposure only to commercially viable (albeit high quality) plays? Will regional theatres become the multiplexes of tomorrow? Are our revered arts organizations going to be as indistinguishable from each other as Gap stores? There are lots of troubling questions. And, unfortunately, there are no easy answers. The theatre community is already bemoaning the fact that many talented playwrights, unable to make a living in theatre, have "defected" to television and film. Few ever return. If theatre is to survive in the U.S. and if talented writers are to remain loyal to writing for the theatre, the regionals must renew their commitment to new playwrights and new plays. � Copyright 1999. TVW Enterprises, Inc. All rights reserved.